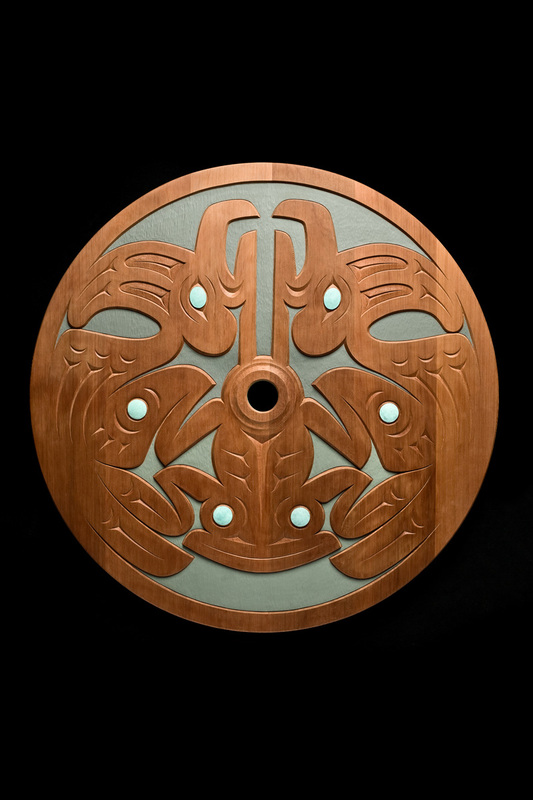 The artist Susan Point initiated the use of the spindle whorl form in contemporary Coast Salish art. This form is based upon a traditional tool for spinning wool. 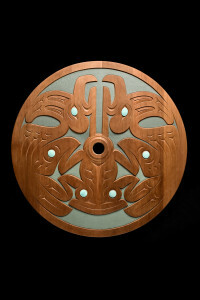 The disc on the spindle whorl was often carved or decorated. 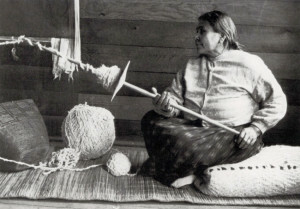 Woman spinning yarn at the Coast Salish village of Musqueam. Charles F. Newcombe, December 5, 1915. Direct duplicate negative. PN 83 – Royal BC Museum/BC Archives. Wool, and blankets woven from it, functioned as forms of currency or wealth in pre-contact Coast Salish culture. Prior to the colonial introduction of sheep to the region, wool was mainly obtained from domesticated Salish “wool dogs.” The dogs’ hair was combined with goat wool, goose down, and plant matter in the spinning process. 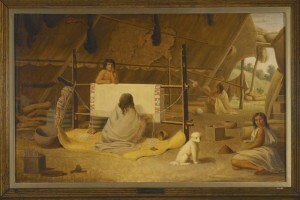 Salish wool dogs went extinct in the late 19th century. Those who continue to practice the art of Salish weaving now use sheep’s wool.